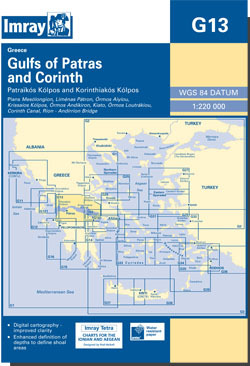 The Gulfs of Patras and Corinth, including the Corinth Canal. Scale: 1 : 218,800. Larger scale plans of Mesolongi, Krissaios Kolpos, Corinth Canal, Ormos Loutrakiou, Kiato, Ormos Aiyiou, Ormos Andikiron, Patra. 2016 EDITION - includes extensive revisions, plus the addition of a new Rion - Andirrion Bridge plan. The latest known depths have been applied throughout.